If I had to guess the one prop I have been asked most about making, I would have to say it is a gag lie detector. Many entertainers have inquired about having one built, but it was a prop that I never accepted the challenge of making until now. The reason, I wanted to make the quintessential lie detector and make it affordable. Something that I have never been able to do until now. This also meant not doing what others have done, which is, making them out of an already existing device. I won’t go into any detail about anyone else’s product, but they really aren’t lie detectors in the way we think of them. They’re magical items that can supposedly detect a lie, but they’re not what we call lie detectors. They are just not the quintessential lie detector that you think of when you think of a lie detector. Which is what I wanted to make, and what I have made. Others have been made that are more in the lie detector category, but they all had major problems that made them impractical. They were either not loud enough, or the buzzer was not good, or they cost an enormous amount of money. These three are all related, and is what I mostly tried to tackle with this prop. When building something like this, a simple way to make a buzzing sound is with a piezo buzzer. When you put electricity onto the buzzer, it makes a buzzing sound, but here’s the problem with that. Voltage determines the buzzers volume. The more volts, the louder it is, but… also, the more volts, the higher the pitch it is. Smoke detector alarms are usually piezo buzzers, and you know how loud and how high pitch they are. Using a piezo doesn’t work, because the only way to get that deep buzzer sound, is to have it at a very low in volume. The iconic “lie” buzzer sound is the whole ball game. If you don’t have that, you don’t have anything. When we think of a “lie” buzzer sound, we think of that deep game show buzzer sound. The only option is a recording of a game show buzzer. A digital recording of a game show buzzer. That also means that the iconic “ding” sound, for truth, is going to have be a recording as well. That’s two different circuits for the digital recordings. The first obstacle to cross in keeping the price down. Just like the piezo, the digital sound circuits aren’t loud either, but at least there is a solution for this. That’s what amplifiers are for. Then again, that also brings up that major stickler point, the price. So far, with just the sound requirements, I was already up to two digital recording boards and an amp. It started off with a challenge to make it affordable. It took me awhile to find the necessary electronic parts for a workable price, but I did. The next part was building this whole thing. If I had to go out into the shop and make each one of these from scratch every time, the price would sky rocket. Instead, I opted to just build the pieces once, make a mold of them, and then cast the multiple pieces in plastic. That also meant I could do all the art work at the same time. The molds were an investment, but it will save me loads of time making them. Which helps with the budget. Back to the quintessential part of it, getting the appearance correct. I looked at it like this. When an artist paints a landscape, and paints the happy little clouds in the sky, the artist paints what we think clouds look like, not what they could actually look like. Clouds are just water vapor. They can take on any shape, but if you don’t paint them right, they won’t look right. Even though they could totally be that shape. A cloud painted wrong just doesn’t look real. 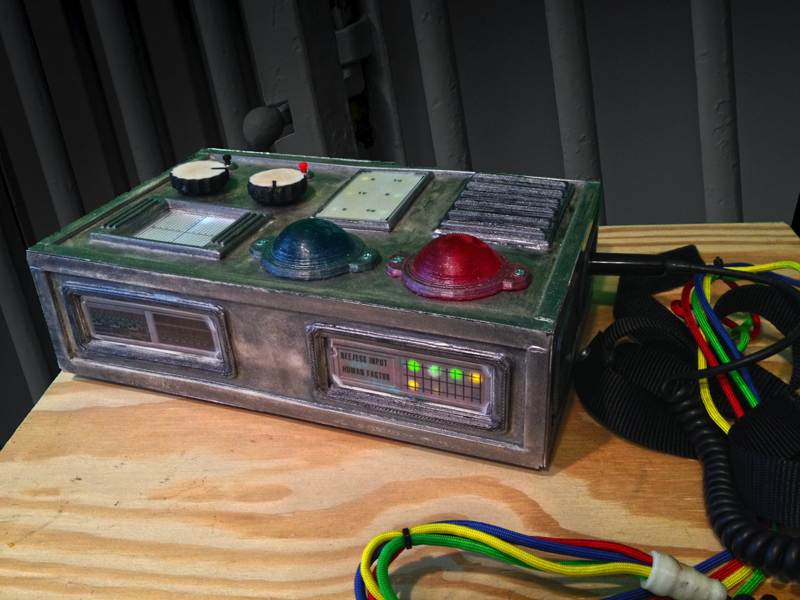 My job was to create the quintessential lie detector that looks like what people imagine a lie detector looks like. At the same time, I wanted it to look like what a cartoon lie detector would look like in real life. For that, there is only one source to go to… The Simpsons. Big red and green lights were a must, and they had to have that “look”. I was imagining that old glass fixtures for railroads look. The rest is pretty much doodads and displays to fill in the space. Now of course, you may be wanting to point out the paper with the scribbles marks. I so tried to incorporate that into the prop, but no such luck. I thought about having a paper conveyor belt that passes by a window to have the squiggles. Unfortunately, with the motor and all, I couldn’t ever work it into the budget. I thought about doing it with lights. Instead I opted for LEDs that blink like an input level. That’s good enough. 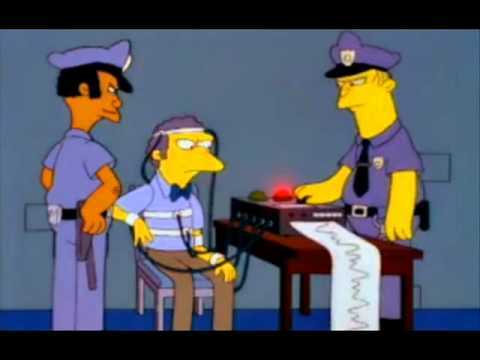 After all, today, real polygraphs are all on the computer and there are no moving arms and paper. Everything is always a give and take. The needed look has been achieved. It gives it enough realism to be serious, and enough cartooning to be fun. I did however add in a little convincer to it. I did want to give it a little realism. You still need to get that apprehension going. I did that by making the head piece plug the power switch. There is no on and off switch to this thing. Plugging the head piece in turns it on. My thinking, is to show the head piece to the volunteer, show the plug, show where the plug goes in, hand them the plug to hold, put the head piece on them, which takes time, and then act like you forget about the plug and go fiddle with the box. The idea is to act like it’s not working and you can’t figure out why. They will either notify you that they are not plugged in, or you act like you finally figured out what’s wrong. That’s when you grab it away from them and plug it in. You could have them plug it in if you want, either way, static noise starts followed by some computer type sounds. With the plugging in, the sounds, the flashing LEDs, it’s all a little cerebral nudge towards realism. As for the head piece, it had to have the right look too. It also had to be something that I could build fairly easily in order to keep on budget. This seemed to all work out really well. The head piece is one of my favorite parts. I wanted a curly cord, but I also wanted various colored cords. I got both. 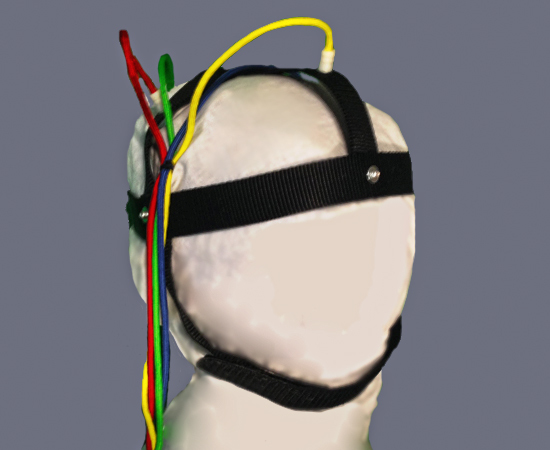 The head piece needed to be made from straps. It should also look as to have some sort of sensor inputs on it. All was achieved with a pretty heavy duty quality result. The straps are nylon webbing that have been riveted together. The rivets make great sensor looking nubs and are extremely durable. Along with some velcro to make it adjustable, and some 3D printed pieces to connect the cords, The head piece came out very nice. A bi-product of the other so called lie detectors on the market, has been people asking me if it’s remote control. The answer to that question is no. This is not a magic trick. The quintessential lie detector is a comedy prop. It’s not magically detecting lies. The quintessential lie detector is a machine that in real life you would have to operate. In real life, you wouldn’t work hands free from the machine. Extra knobs that click were added just to give you things to mess with. There are two buttons that set off the lights and sounds, and secretly pressing them is no big in the confines of the operation of the machine. That is the reason a remote was not added. That, and the fact that it would double the price. So, what is the price that I got the quintessential lie detector down to? Some other examples on the market go for over a grand, and they aren’t even the quintessential lie detector. The size is hard to tell from the pictures, but the actual dimensions are… 11″ x 7″ x 3″. It’s bigger than you think it is. So what is the price? Believe it or not, I can make these for $300. It took years keeping my eye out, thinking about ways, and learning new techniques to get a quintessential lie detector for that price. I hope there are some entertainers out there that can benefit from my hard work. I already have my routine idea I am working on. Get yours custom made at Raincloud Magic.